I have a stall at Stroud Farmers Market which is held every Saturday at the Cornhill 9.00 am - 2.00 pm. I am very often there on the 2nd Saturday of the month but check my calendar first. I shall not be doing the Cheltenham Arts and Crafts market in 2019. However, I am very happy for people to contact me and arrange to view and collect pots from me at home where I also work. See the Contact section of this website for details. Bourton Artisans is a shop in Bourton on the Water, Gloucestershire which stocks locally made arts and crafts. You will find my pottery there. 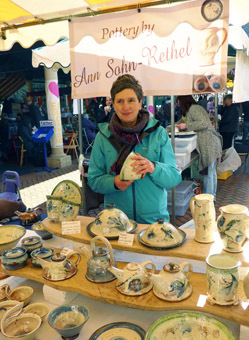 You can now follow me on Instagram as ann_the_potter.